Karnataka Polytechnic 2019: Admission process is conducted every year by Directorate of Technical Education, Karnataka. It is state-level admission process for those applicants who are interested to get admission in diploma courses in 81 Gov. Polytechnics, 44 Govt. Aided Polytechnics and more than 150 private polytechnic colleges in Karnataka. Karnataka Polytechnic Admission will start in the upcoming month. Eligible Candidates can fill the application form published by DTE, Karnataka on their official website i.e. www.dte.kar.nic.in. and take admission in various polytechnic colleges of Karnataka. Directorate of Technical Education, Karnataka has announced the admission process for diploma courses recently on their official website www.dte.kar.nic.in. 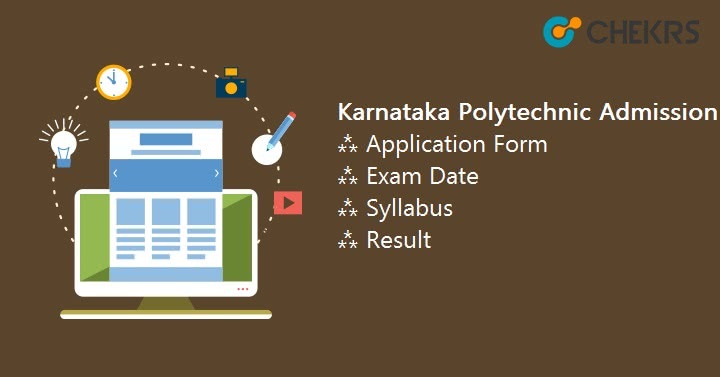 Karnataka Polytechnic 2019 Application Form is expecting to be released in May. Eligibility Criteria is required for getting admission in polytechnic colleges of Karnataka state. Before filling the application form, must check the Eligibility Criteria for Karnataka Polytechnic. Must pass 10th/equivalent examination from the recognized board of Karnataka or Central Board. Must score with minimum 35% marks in Karnataka SSLC exam or equivalent exam. Students who are applying for qualifying exam other than Karnataka board have to show the eligibility certificate issued by the Secretary, Board of Technical Educations, Bangalore. Karnataka Polytechnic 2019 admission procedure is organized by DTE, Karnataka. Admission process in various diploma courses will start soon after the release date of application form. Karnataka Polytechnic Application Form 2019 will publish probably in the month of the 1st week of May 2019 and will be last to 4th week of May 2019. Eligible candidates can check the portal and fill the Karnataka Polytechnic application form. Visit the official portal of Directorate of Technical Education, Karnataka dte.kar.nic.in. Click on the link given there to fill the application form. Candidates have to make challan according to their category fee in any branch of State Bank of India and obtain the counterfoil of the challan. Submit the filled application form along with attested documents and counterfoil of bank challan to the nearest document verification centers/Option Entry Help Centers made by DTE, Karnataka. Application Fee for General/OBC Category is Rs.100/- and for SC/ST category, the fee is Rs.50/-. Dates are not decided yet, so you can check the expecting dates related to Karnataka Polytechnic 2019 Admission Process. It may change after the official announcement by the authority of DTE, Karnataka. The Karnataka Polytechnic Syllabus 2019 is limited to subjects of class 10 like Science and Mathematics. The updates regarding syllabus will be provided on the official website. We will update you after getting notification of detailed syllabus. Candidates are requested to check the portal regularly. Karnataka Polytechnic Exam will be conducted in the month of May 2019. To prepare in the better way and score good marks, you can check the previous year sample paper provided with the solution in PDF form. Practice previous year sample paper. Go through the concepts and formulas only. Make notes on each topic and revise them regularly. Make the timetable and divide the time on each subject. Take help of reference book. The candidate who has successfully submitted the Karnataka Polytechnic 2019 Application Form can download their admit card from the official website of DTE, Karnataka. The authority of DTE will publish Karnataka Polytechnic Hall Ticket online which contains the details of applicants like name, date of birth, exam center, roll no. Result will be declared in the month of June. Candidate can check Karnataka Polytechnic 2019 Result publish by the authority of Directorate of Technical Education, Karnataka on the official website www.dte.kar.nic.in.Karnataka Polytechnic Score Card contains score, category-wise rank, state-wise rank. Visit the official portal of DTE, Karnataka. Click on the link provided here to download the scorecard. It will ask for details like application no. or roll number, date of birth. Enter the details and it will proceed to the result page. Cut-off will be released after the declaration of results. DET, Karnataka will announce Karnataka Polytechnic 2019 Cut-Off online on their official portal. Students get rank on the basis of cut-off marks. Those who score above cut-off will get government polytechnic colleges or good private polytechnic colleges and students having fewer marks will get private polytechnic colleges. Cut-off is decided on the basis of a number of appeared student, difficulty level of question paper, last year cut-off & category wise reservation. Eligibility certificate in case if passed the qualifying examination from the educational board other than Karnataka. After the release of result and cut-off, students can get admission in more than 250 polytechnic colleges across the state. Counseling will start from the month of July, 2019. Candidates, who want to attend the counseling can download the letter of counseling from the official website and take the print out of it, at the time of counseling. Please bring the required document for verification at the time of counseling.